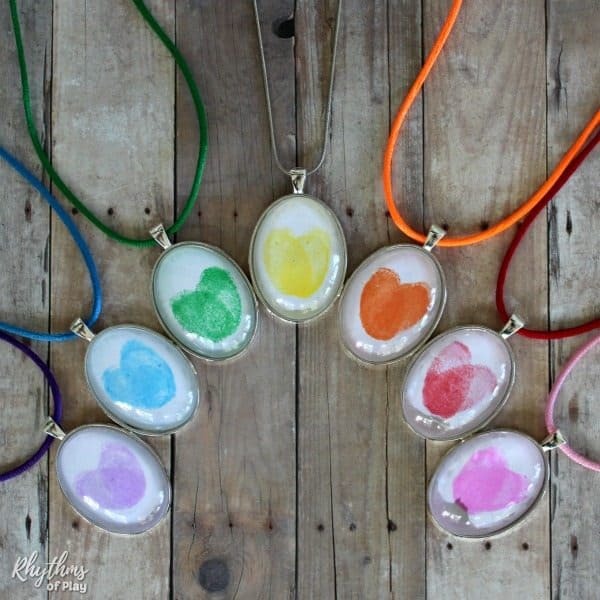 A fingerprint or thumbprint heart necklace is a unique handmade craft and gift idea even kids can make. 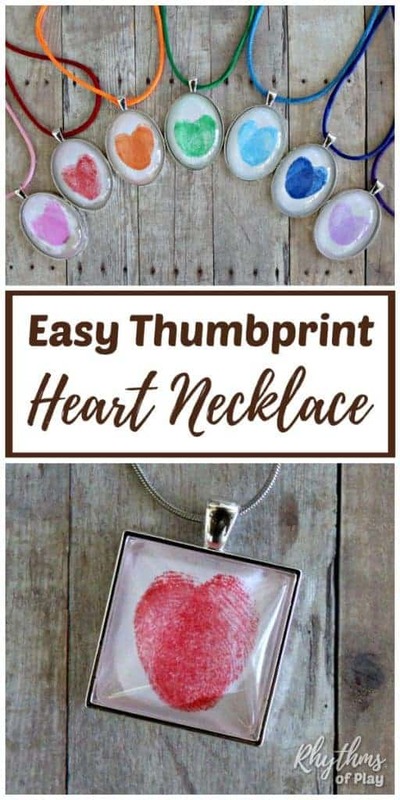 Use this easy fingerprint heart necklace jewelry making tutorial to make one of a kind fingerprint necklace pendants and charms your family will treasure. Perfect keepsake craft idea for Valentine’s Day, Mother’s Day, Christmas, and summer camp! Choose the type of necklace pendants you would like to use from the materials list below and then gather the fingerprint or thumbprint heart necklace jewelry making supplies you need. Written step by step directions and a thumbprint heart video tutorial can be found in the section below the jewelry making supplies. 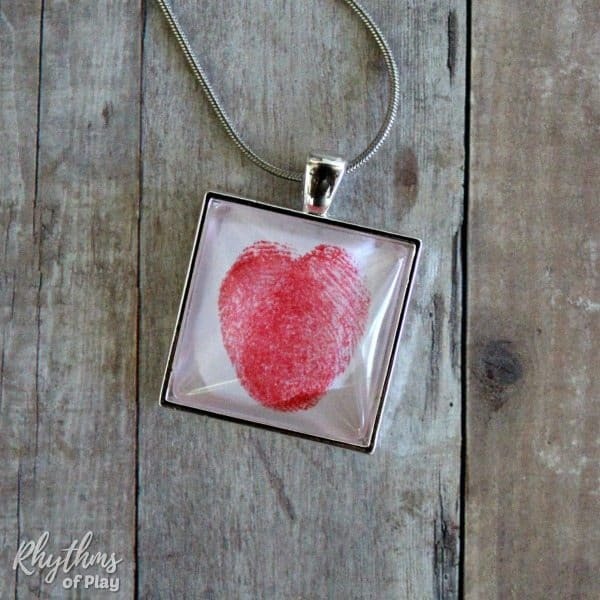 Another fun thumbprint heart necklace gift idea can be found on Mama Miss. 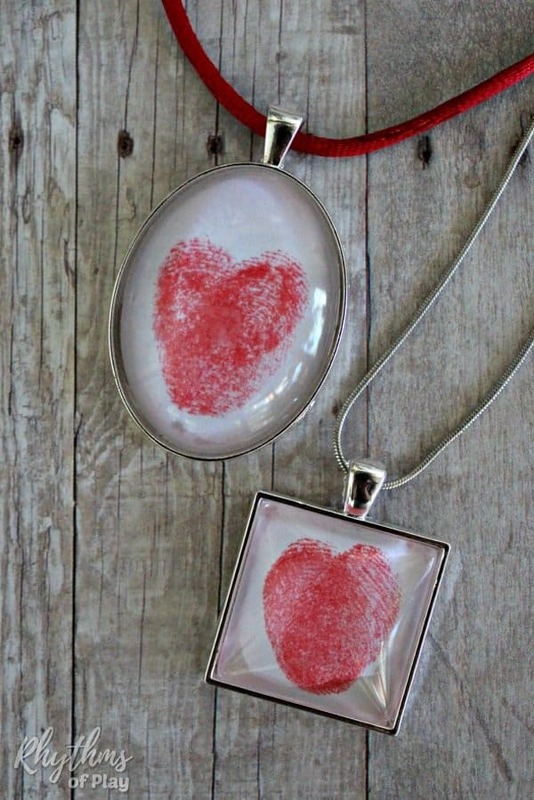 You might also like to try fingerprint art necklaces and thumbprint heart keychains. Click on the link for all the details! 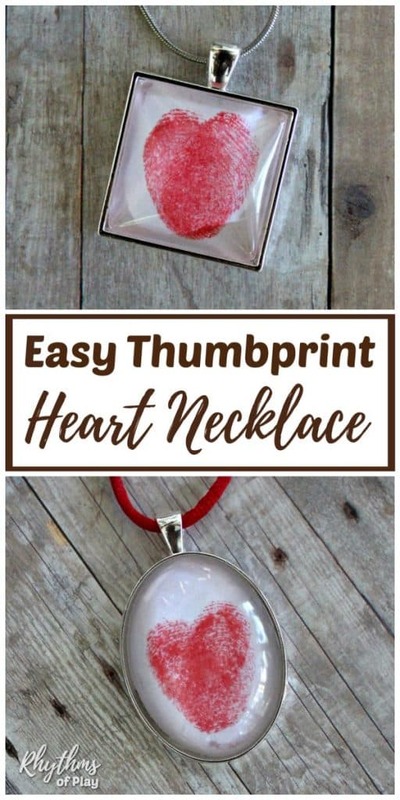 Choose the type of photo pendant shapes and pre-made necklaces you would like to use to make thumbprint heart necklaces and/or thumbprint heart keychains from the materials list below. Related: Gorgeous Handmade Gifts Even Kids Can Make! A fingerprint or thumbprint can be used to make a heart for a necklace pendant. Use the easy directions below to make a fingerprint or a thumbprint heart. Press finger or thumb into a finger ink pad . Gently press finger or thumb with ink onto the paper. Press finger or thumb into the ink pad again to reapply more ink. Tilt finger or thumb slightly and press down again to make a fingerprint or thumbprint heart. Allow fingerprint ink to dry before moving on to step 2. Place a drop of diamond glaze adhesive or clear-drying glue on the back (flat side) of glass cabochon. Place the cabochon on top of the fingerprint heart glue side down. Allow glue to dry overnight. Use small scissors to trim and cut away the excess paper around the glass cabochon. . Apply diamond glaze adhesive to the inside of a pendant tray. Place glass gem with thumbprint heart into the pendant tray and press down to remove air bubbles. Hold firmly for 30 to 60 seconds. Wipe edges clean with a damp cloth. Allow fingerprint necklace pendant to dry overnight. Thread a necklace through the loop of the thumbprint heart pendant to finish your fingerprint heart necklace. Bead your own necklace or use one of the pre-made necklace options below. Note: If you bead your own necklace make sure to place the thumbprint heart pendant onto the necklace when it is halfway finished, otherwise it may not fit over the beads to hang down in the middle. Step by step directions for making fingerprint heart necklaces and thumbprint heart keychains can be seen in the video below. 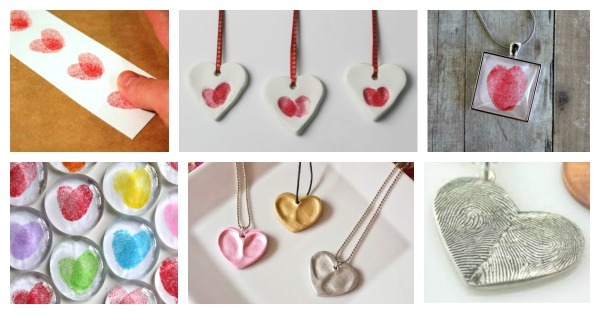 DIY Thumbprint heart necklaces, thumbprint heart keychains, and thumbprint heart magnets make an easy gift idea for Valentine’s Day and Mother’s Day. They are also a fun keepsake heart craft to make at summer camp! Simple keepsakes like a fingerprint keepsake gifts are always a favorite with friends and family. DIY photo necklaces and keychains also make wonderful handmade gift ideas. Don’t forget to pop over to check out all of the other beautiful gift ideas kids can make and DIY and ready-made gift ideas for the whole family! If you are making thumbprint heart necklaces to give as gifts, make fingerprint love bug cards to go with them to complete the gift. 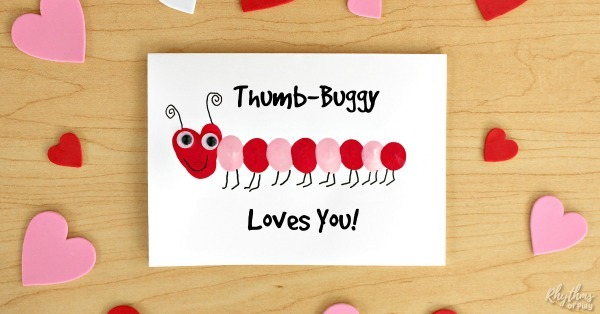 We have come up with lots of fun thumb-buggy card message ideas you can use to personalize your gift for several occasions including Valentine’s day and Mother’s day!